It is caused because of hypersecretion of insulin. It refers to deficiency of glucose in the blood. It is caused because of hyposecretion of insulin. It refers to excess blood glucose levels in the blood. Hypoglycaemia refers to an abnormally reduced level of sugar, or glucose, in the bloodstream. 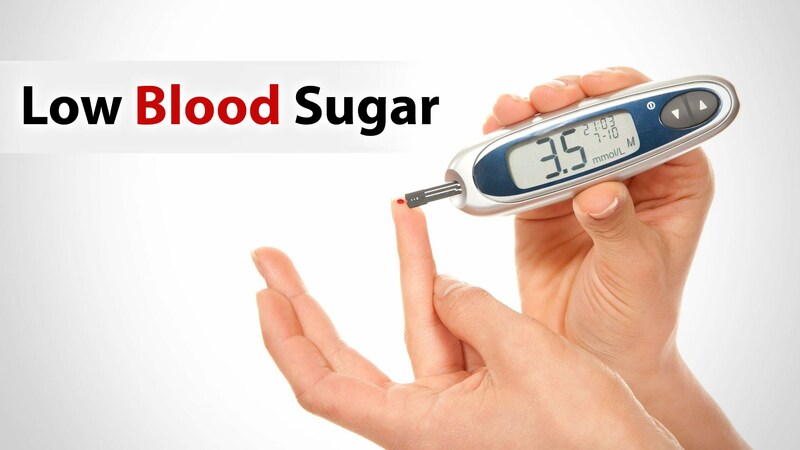 Hyperglycaemia refers to an abnormally increased blood glucose (blood sugar) level. Hyperglycaemia is a hallmark indication of diabetic conditions (both type 1 diabetes and type 2 diabetes) and prediabetes. Some medications that are meant to treat health issues other than diabetes can result in hypoglycaemia or even hide its symptoms. Tumours in the pancreas (insulinomas) or any autoimmune diseases increase insulin levels in the body and that can also cause Hypoglycaemia. Hypoglycaemia can also be caused intentionally by the inappropriate utilization of sulfonylurea medicines. Hypoglycaemia results when other diseases and health issues affect the body’s glucose metabolism. The diseases could be issue of pancreas and endocrine set up, disorders of liver, kidney and adrenal gland (such as Addison’s disease), In very unusual cases, nonpancreatic tumours cause hypoglycaemia. In rare cases, hypoglycaemia may result because of inherited enzymes. Alcohol leads to a drop-in blood glucose levels causing Hypoglycaemia. Other causes- Hypoglycaemia also may result during early pregnancy or with lengthened fasting or missed food, acute malnutrition, or due to long hours of strenuous physical activities. Unusual tumours that produce hormones like glucagonoma and pheochromocytoma. Taking certain steroids like beta-blockers, prednisone, phenothiazines, estrogens, glucagon, oral contraceptives, and others, can increase blood glucose levels and cause Hyperglycaemia. The onset is usually fast with good health state previously. The onset is usually slow with bad health state a few days before. Hypoglycaemia, also called reduced blood sugar, takes place when the concentration of glucose in your blood drops less than the normal. For many individuals with diabetes, that means a level of 70 mg per decilitre (mg/dL) or low. Hyperglycaemia does not show any symptoms until glucose levels are significantly increased and are above 200 mg per decilitre (mg/dL), or 11 millimoles per litre (mmol/L). Confusion, abnormal personality changes, such as the incapability to finish routine activities. People with acute hypoglycaemia may look as if they’re inebriated. They may mumble their words and move gawkily. A diagnosis of hypoglycaemia is done not only on the basis of signs and symptoms. Rather, endocrinologists look at the Whipple’s Triad, named after Allen O.Whipple. These 3 factors help health practitioners diagnose hypoglycaemia. symptom relief with by treating the condition. Reactive hypoglycaemia is diagnosed by a blood test. The test is done by fasting overnight, or between meals. This blood test tells about your average blood glucose level for the past 2-3 months. It works by measuring the % of blood glucose associated with haemoglobin, the oxygen carrying protein in the RBC’s (red blood cells). Early symptoms can be treated by consuming 15 – 20 grams of glucose or simple carbohydrates. Once blood sugar is at normal levels, eat some snack or a proper meal and keep an hour or two for your next meal. Follow your diabetes meal plan: The food you eat must be in balance with the insulin performing in your body. Monitor your blood glucose level: Monitor your blood glucose levels to make sure that it remains within your target range. Take your medicines as prescribed by your general practitioner. Adjust your medication and treatment plan if you are changing your physical activity. Dr. Amita Fotedar -Dr. "Difference Between Hypoglycaemia and Hyperglycaemia." DifferenceBetween.net. 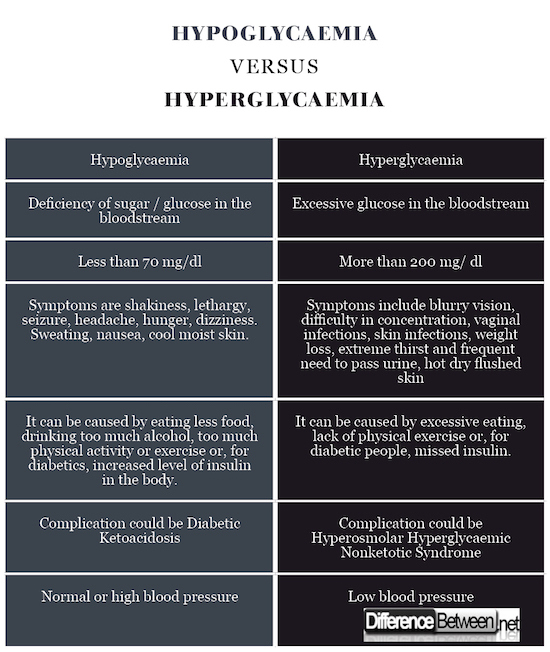 April 3, 2018 < http://www.differencebetween.net/science/difference-between-hypoglycaemia-and-hyperglycaemia/ >. Asymptomatic, N. H. (2008). Glycemic Control and Hypoglycemia. DIABETES CARE, 31(10). Sommerfield, A. J., Deary, I. J., & Frier, B. M. (2004). Acute hyperglycemia alters mood state and impairs cognitive performance in people with type 2 diabetes. Diabetes care, 27(10), 2335-2340.